Cristiano Ronaldo left Real Madrid for Juventus this past summer, but former AC Milan director Massimiliano Mirabelli has revealed it could have been very different. The former club chief revealed last month that negotiations had taken place with agent Jorge Mendes over a move to the San Siro, but he has now reiterated that the Portuguese superstar was close to joining the Italian giants. However, issues with former owner Yonghong Li seemingly scuppered that opportunity, and ultimately that paved the way for Ronaldo to join Juventus instead where he has made an impressive start. 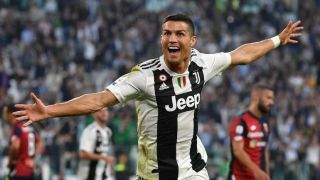 While it may prove to be difficult reading for Milan supporters, Mirabelli has offered more details into how talks were developing over the possibility of signing Ronaldo. “We weren’t kidding ourselves: I can assure you that if the current owners had been in charge at the time, at this precise moment Cristiano Ronaldo would be wearing the Milan jersey. I can mathematically guarantee it,” he said, as reported by Calciomercato. Instead, having failed to capitalise on Ronaldo’s desire to leave Real Madrid, he has instead gone on to bag 11 goals and seven assists in 18 appearances in all competitions for Juve so far this season as they pursue an eighth consecutive Serie A title. Further, given his pedigree in the Champions League, he will undoubtedly emerge as a key figure for the Turin giants as the competition plays out, while Milan must make the most of what they have as they look to secure a return to Europe’s top table for next season.